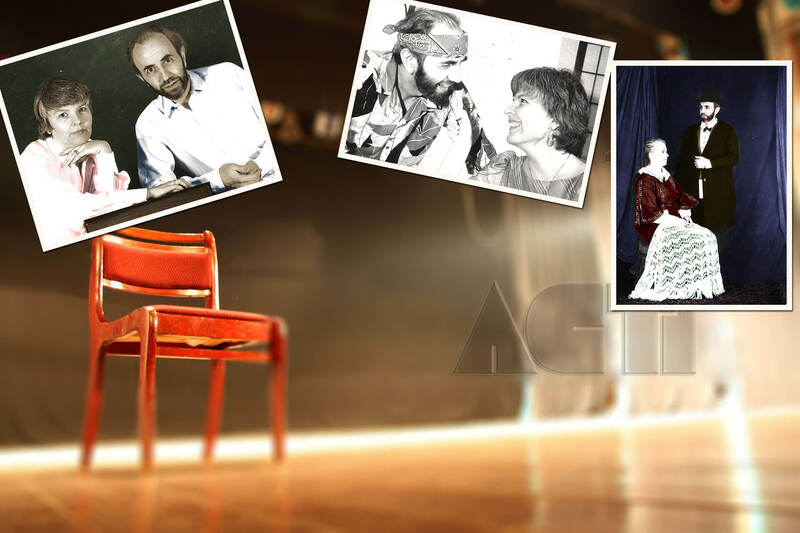 Throughout the years, Act1 has been involved with writing, directing, acting & filmmaking and we have managed to create a significant amount of work that contains theatre plays, short films & books. Our most important work, soon to be added to our website, is the MORAL COURAGE WORKSHOPS, where students are taught to think for themselves so that they can make a difference in the world...here, now, today! The world has yet to find,a way to prevent another Holocaust. Maybe this is a way. More anon. Still, from our website, you can get information about us, read reviews of our books & movies and even order one of our books, scripted plays or films. An order form follows. Take a look. Thanks. The first quarter of 2015 is as busy as the last quarter of 2014. We have been reconstructing our website, as you can see. The IOANNINA, MY IOANNINA tour book will be self- published here in Greece for distribution within Europe and printed in America later, thank to contributors who have an interest in Greece or who have been with Act1 for a length of time. You can turn to 'Books' to see what it's about. lt will be available through Act1 or at KKI in NYC. We are planning a trip to America this spring. We are showing some of our films in the Northeast, presenting IOANNINA, MY IOANNINA at KKJ, and visiting friends & relatives around the country. Diana & I are currently directing another Chekhov play, THE BEAR, in Greek, which opens the last week-end in February for two weeks. lf you're here, join us. What if more rescuers filled the world than perpetrators of violence and crime? The question is one that West Long Branch residents Diana Sunrise and Isaac Dostis ask others regularly. The husband-and-wife team use their theater group, Act 1 Presentations, to promote a "sliver of hope" that people don't stand by while violence is committed, but rather, stand up to it. 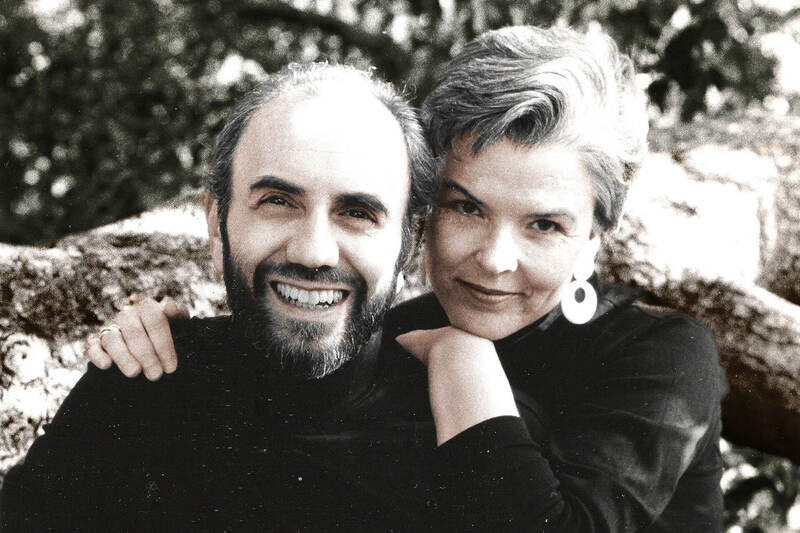 Using the Holocaust as an example of the "sliver's" impact, the couple lead Moral Courage workshops, bringing acting and interactive theater to schools throughout New Jersey and neighboring states. Together, they make their life's work teaching nonviolence and peace-making in schools, libraries and museums. Their workshops include the daylong "Moral Courage Leadership Program." These programs use an acting method developed by Russian director Konstantin Stanislavski. With it, the couple promote "seeding," or planting seeds in students and adults to think differently to create a better world. The director believed that it's crucial for actors to understand their character's thoughts to create the character's behavior on stage. When expressed truthfully, thoughts and behavior bring the actor into the life-like state of emotions. Dostis and Sunrise bring this belief into the classroom. If children can learn what their thoughts are, then through theatrical means, they can change their thoughts and thereby their behavior and emotions. "Actual thoughts affect behavior," Dostis said, "We speak with images (it's difficult to speak abstractly), so the stronger the image, the stronger the emotion." Behavior, being a "series of actions," can be changed. "Just as actors choose how they build their character, children can choose the way they think and ultimately, the people they want to be," Dostis said. The "sliver of hope," he said, is where we learn our lessons. "We understand bystanders and victims, the perpetrators; but the most depth comes from the rescuers.If they can do in the worst of times (such as during the Holocaust), why not now?" "It's difficult not to sand up whenever you know the person," Dostis said. Giving Adolph Hitler as an example of one of the worst bullies in history, the couple offer ways to stand up to bullies in schools today. Students practice being as loud as a bully, responding with rhyming phrases, using body language and finding someone nearby to help. "We teach the children, become an actor to get what you want. Ask a stranger nearby, 'Excuse me, do you have the time?' If you need help," Dostis said. The two have many other projects under way, including scripts for a dozen one-act plays and Dostis' new children's book, "Ten Gold Medals: Glory or Freedom." An adventure story, it's based on a true story of his uncle's escape from Greece during World War II. "Not many people know there was a Holocaust in Greece ... as well as in the rest of Europe," he writes in the book. As Dostis' uncle, Isaac Koen, escapes with his family through the underground from athens to Palestine, he must systematically give away his gold medals won at state competitions for javelin, hurdles and running in the late 1920 and 1930's. The medals become literal tokens of appreciation for those who help his family get to safety. The book will be published in October and friend Tony Urgo has film rights for Walking Tour Films in San Diego, Calif.
Sunrise is working on a children's book: "I Wanna Be a Giraffe," as well as an autobiography tentatively titled, "Mommy, Please Listen!" 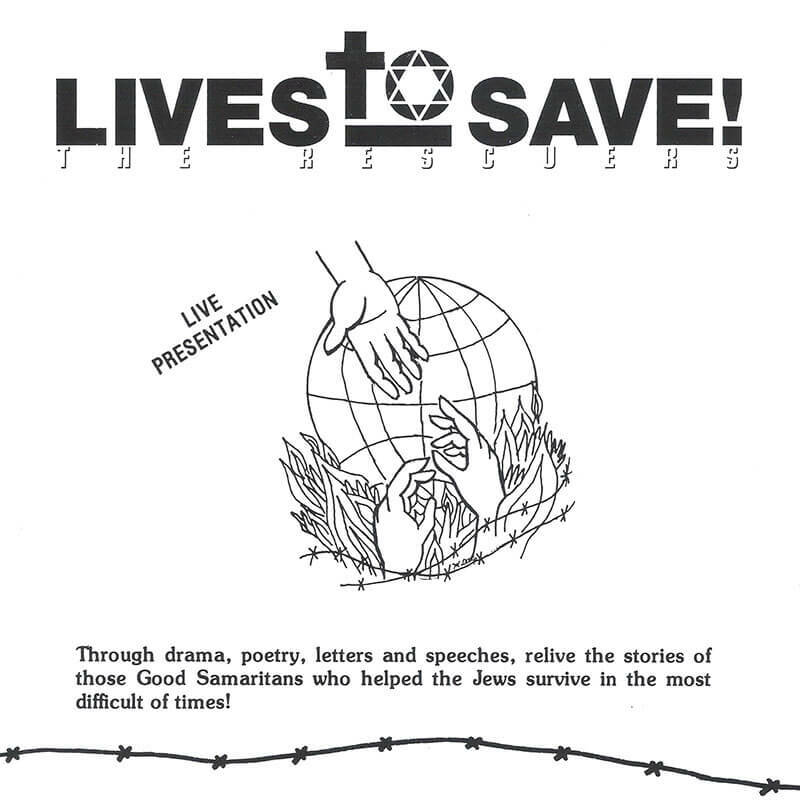 While a member of the Actors Studio in Manhattan, she created many roles for stage and theater, including for their video, "Lives to Save: The Rescuers." Film directing is one of Dostis' passions. Their Act 1 Presentations film, "We Are Not Alone - Greek Jews & The Holocaust," recently was shown at Fairleigh Dickinson University in Teaneck. Narrated by Dostis and Sunrise, the film is based on the Dostis family's experiences during the war. The eventual rescue of part of his family by Greek Righteous (non-Jewish rescuers) and Kristallnacht, the night in 1938 when synagogues were burned in Germany and Austria, also are part of the story. Another of Dostis' films, "Farewell, My Island," was timed to the actual 22 minutes that it took to round up Jews on the Greek island of Corfu. Sunrise's voiceovers punctuate the film as a young girl trying to understand why her familly is herded to the beaches and boats. Dostis is also the founder of Kehila Kedosha Janina Synagogue in the Western Hemisphere. An exhibit, "Out of the Ashes," opened there April 4, commemorating the 60 years since the Jews of Janina were taken. Some of them wre relatives of Dostis. "We wanted to show how people survived and made lives for themselves," he said. One of the four areas in the exhibit features the book "Yannina: A Journey to the Past," written by his third cousin; Eftichia Nachmias. Dostis edited and wrote a dedication for the book. The couple are busy with new projects: another film, "Ioannina, my Ioannina", where Isaac's family comes from. Act 1 Presentations has been working in New Jersey schools for over 20 years and we have created an amount of work that covers film, books and live performances, all based on moral courage with many fitting into Holocaust Studies. We hope you find something to fit your curriculum. 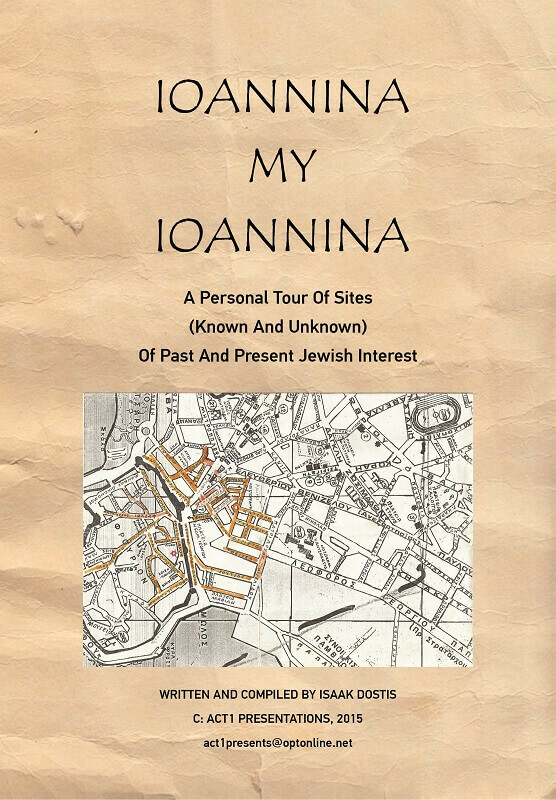 More than a tour book of Ioannina, Greece’s points of Jewish interest; includes the synagogue, the cemetery, the roundup areas and other points of overlooked Jewish history, with the author as your personal guide. Divided into three integral parts: the two day tour, personally speaking & appendices. 122 pages - B/W photos, maps, personal stories and more. 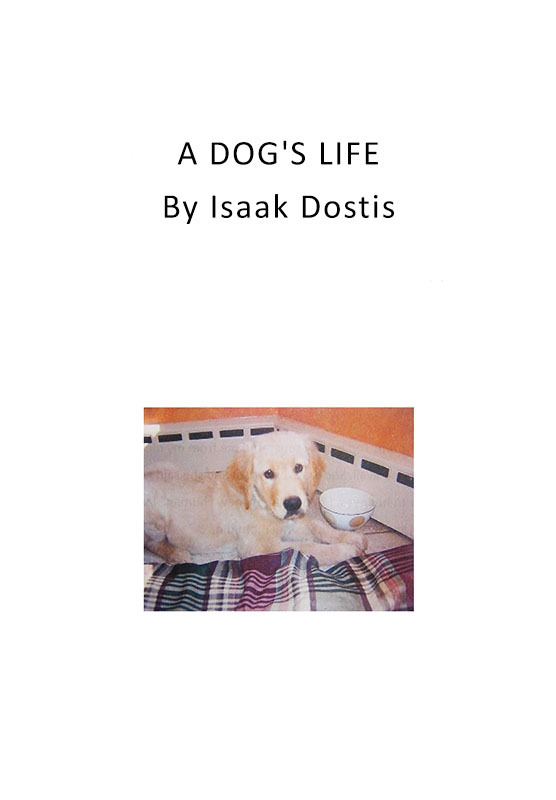 As in the title of the soap opera "The Days of Our Lives" so does A DOG'S LIFE give a day by day account of how Greeks often disparage & degrade man's (& woman's) best friend, until a savior (or two) comes along. 12 pages, 2 b/w photos. All the salad ingredients are in an uproar! Each one thinks that they are the most important element of a Greek salad and without them there is no Greek salad, until the mistress of the house adds them to a large bowl. Together for the first time, it’s a new world for all of them. With the help of tongs, they tumble and play and mix in a glorious salad of tastes and colors. 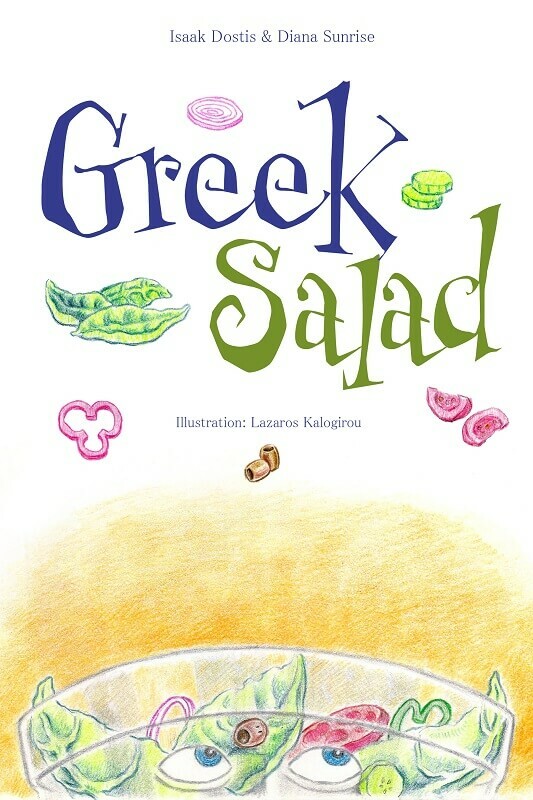 It takes all of the ingredients to make a great Greek salad and a better world. Recipe included. For 6 to 9 year olds. 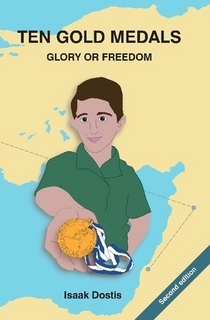 Isaak’s uncle, Isaac Cohen, was a sports hero in Greece. Using the medals he won in javelin, running and hurdles, he escapes Nazi Greece with his family, with the child, Laki, caretaker of the most precious of cargo…the medals. A true yet under-told story of the Holocaust in Greece. For teens & adults. · Commemorating The Holocaust Will Not Stop Another Holocaust From Happening! It is now over seventy years since The Holocaust ended with the opening of the concentration camps and the slow, ever so slow, recognition of what had taken place. And yet…and yet… with the diminishing amount of survivors left in the world, soon, a commemoration will be for whom? Many theatre people know of Constantin Stanislavski and his famous system (Americans may know parts of it better as “The Method”) but most don’t know his views on moral courage that went along with his theatrical devices that helped build an alive human being on stage. When we look around at the news being reported by the media, by the history we keep reading about, we begin understanding that the signposts of our lives revolve around war and colonization, poverty and starvation, holocausts and genocides. Our ‘signposts’ extend to entertainment: The American Psychological Society reports that children watch 21-23 hours of television a week, and that by the end of elementary school, the child will have seen 8,000 murders and 10,000 other acts of violence. And this is beyond CNN’s instant recording of war. Yet the child is also attacked in school itself. Our history books include so many violent acts. Notice how much ‘reality’ our books are full of. So we teach the violence and war that we see on television, see in our films, and hear in our modern music. The cycle grows and grips us. Watch children on the playground or in the cafeteria; notice inclusion/exclusion, haves/have-nots as a reflection of our lives. Isn’t this how wars begin? Isn’t this how the Holocaust began? Are we repeating history? With our theatrical experiences as actors and teachers, we have found that in order to build a character on stage, we need to know the thoughts, behavior, and therefore the emotions of the character. As this is true for theatre, why not in life? If I begin understanding my everyday thoughts (and therefore my behavior) I can change my thoughts and my behavior. My emotions and attitudes may change as well. Experts call this Behavioral Psychology. Actors call it Building a Character. Schools offer us the possibility of planting these seeds. If a child can learn, through theatrical means, what his thoughts are, then he can change those thoughts with the theatrical games we play. Just as actors can choose how they build their character, so can children choose the person they want to be. Once they learn the technique of choosing their thoughts, they can also choose their behavior and become the person they want to be through choices, hopefully loving, caring and non-violent. We have a chance to change society, one good step at a time. ISAAC DOSTIS has worn many hats in his artistic career. As actor, director and teacher, he has worked with the famed Henry Street Playhouse & The Sonia Moore Studio, both in New York City. As a filmmaker, he has produced the award winning video LIVES TO SAVE: THE RESCUERS, about those who risked their lives to save Jews during the Holocaust. Currently he writes and teaches with Act 1’s Moral Courage Programs. DIANA SUNRISE, co-founder of Act 1 Presentations, has helped create and write shows and workshops for schools and organizations throughout the states. While a member of the Actors Studio in New York, Diana also created many roles for stage including a video LIVES TO SAVE: THE RESCUERS. A graduate of Seattle Pacific College in Seattle, Washington, she received her BA in Speech and Drama receiving awards as Best Actress in THE INNOCENTS and THE MIRACLE WORKER. BOTH are co-recipients of THE RAOUL WALLENBERG AWARD for teaching Moral Courage and THE AXELROD AWARD for educators in Holocaust Education. Stanislavski in his lifetime, worked in a medium which influenced people’s lives. Today, commercials, to a vast extent, do the same thing. The current standard practice in presenting a music theatre piece is to break it down into its basic elements of drama and music. Usually this results in a lack of vision as to an overall point of view. By organically interconnecting the dramatic and musical elements of a work, we enable a flow of behavioral logic leading toward an organic whole. This connection between the two facilitates the construct of a logical flow of its episodic elements within the organic totality – the musical connection. The lessons of the Holocaust lie in the reasons over 14,000 documented rescuers risked their lives to save Jews, breaking the notion that no one helped in this most trying of times. A series of dramatizations for adults & school children, grades 4-12. Cast of two performers (m/f) or many performers. Time: approximately 50 minutes. The play’s message is about triumph & moral courage in the face of adversity. The dramatizations by Dostis & Sunrise recounted the Holocaust through the eyes of the rescuers. The duo focuses on people who are unsung heroes of history when writing their plays. [This play offers] dramatic interpretations of the situations faced by those who risked their lives to save Jews during the war. The material is excellent, the text easy to understand. I enthusiastically recommend this play & their performances. They kept the students spellbound. On behalf of a grateful audience, we thank you for performing your play ‘Lives to Save’ here in such a magnificent manner. We were treated to a meaningful experience. It was a moving account of the Righteous. Your vignettes impacted & left a great mark on our students. A few simple props & the skill of the writers & actors was all that was needed to make it amazing. 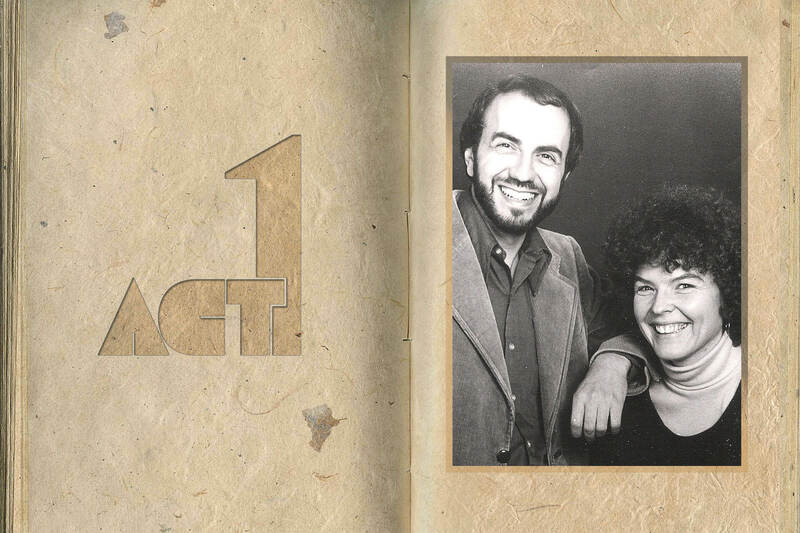 Local viewers are perhaps most familiar with Act 1’s frequently run ‘Lives to Save: The Rescuers,’ a play written & edited by the duo. 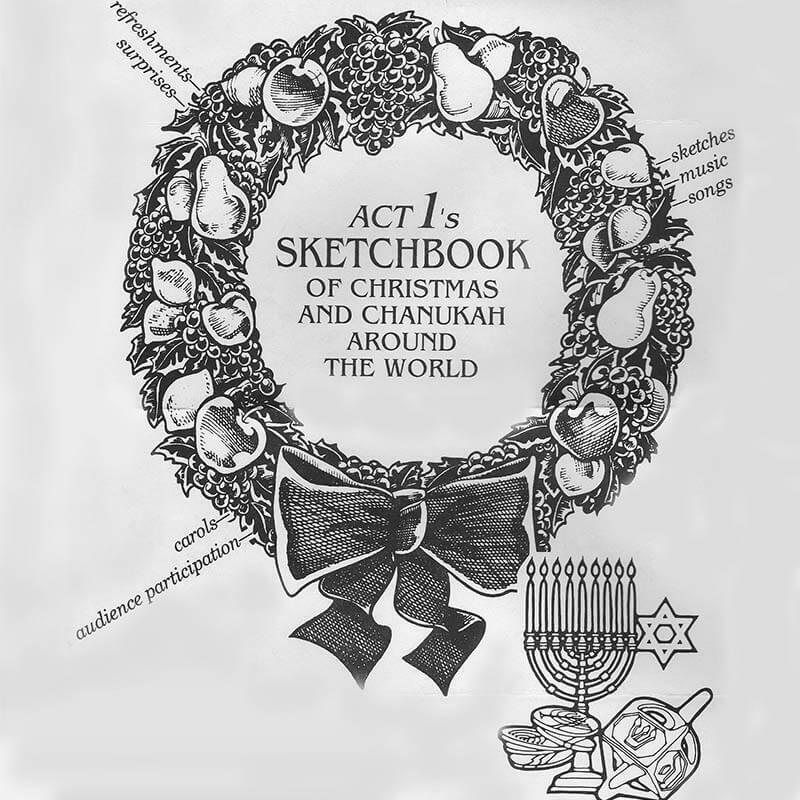 It tells the stories of Christians who helped Jews survive during the Holocaust. It’s message of a ‘glimmer of light even when it is the darkest’ can only bring understanding & reassurance. The play speaks of an important theme. It is an original & powerful play which was uniquely conceived & professionally presented. It will remain etched in the mind & influence our moral judgement transcending the Holocaust into everyday life. The new information you provided gave a particular perspective to the Holocaust for us to study. I was impressed by the structure of the play& how it moved along, each sketch adding some new dimension to the attributes of the Righteous. The play is an important, useful, informative &moving production that clearly draws the audience in, captivates as it elevates & touches all who witness it. The content of the material & your ability to develop a dialogue with the audience helped each student internalize the message. I’m glad someone opened our eyes to the Righteous. We learned so little about this group in our classes. Holocaust education must result in a greater awareness of righteous behavior. Your play & discussion that you led afterwards was perhaps the best event this summer. The scholars, all 100 of these talented, rising high school seniors, found their attention, their moral questioning, & their hope for the future captivated by your presentation. That we could be so well entertained even as we were profoundly informed, is a tribute both to your talents & your dedication. The actors did a superb job in acting, educating & sensitizing students to the Holocaust. One of the most thought provoking, enlightening experiences we have had. The most important aspect of your performance is the message. [The company of two] gave a gripping, moving & informative performance, which we’ll never forget. The universal themes came through loud & clear. I sensed a bonding in the room when your play came to an end. We know the name but we may not know the reason. 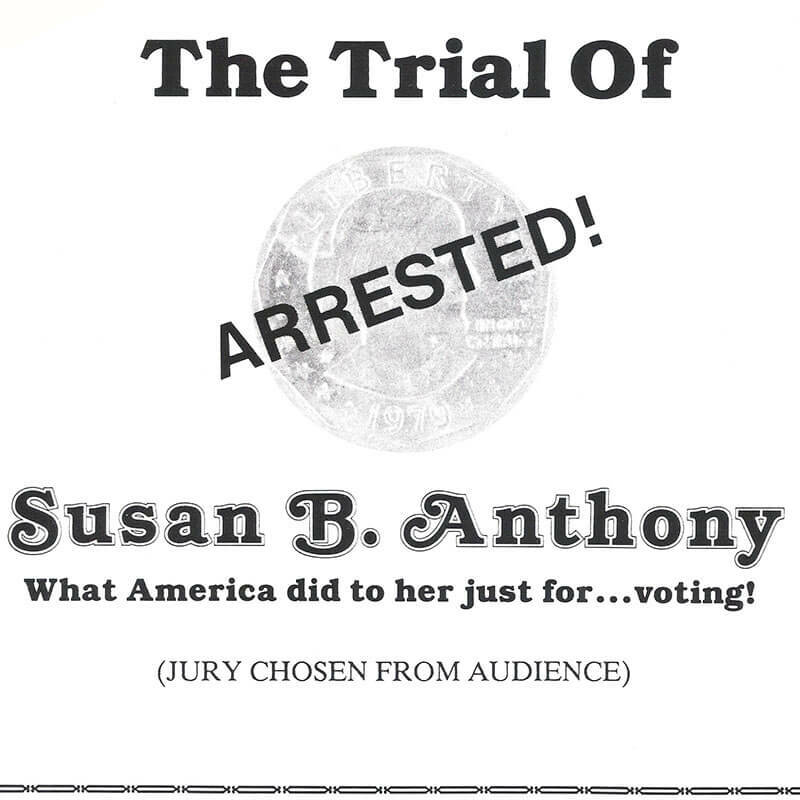 Susan B Anthony was arrested for voting & what America put her through at the trial is something to behold. The show includes actual trial testimony. The jury is chosen from the audience. For adults & school children, grades 4-12. Cast of two performers (m/f) or many performers. Time: approximately 40 minutes. Your research of the material presented was extraordinary. Through your research, you bring out true, unusual facts, unknown to the general public. Your account of the incidents is so real. Your creative dramatization of the actual testimony…to write women back into history…presented a wonderful, vibrant look into history. A good play brings across the feel of the time & the historical context with particular immediacy. We were not only pleased with the presentation, but you have my appreciation of the manner in which you make language in your presentation accessible to some of our foreign students. …using powerful prose… the couple portray figures from history showing the danger [SBA] faced taking the position [she] did. Using actual testimony from the proceedings, [the actors] reenacted the experience of Susan B Anthony. Sunrise & Dostis wrote their production based on the transcript of the trial. Other jurors later concurred that the dramatization was much more effective than a lecture. The message was clearly imparted. The play imparts lessons in history & jurisprudence. To prepare, Dostis & Sunrise did hours of research for arguments made in the case. The program was informative & entertaining as well. 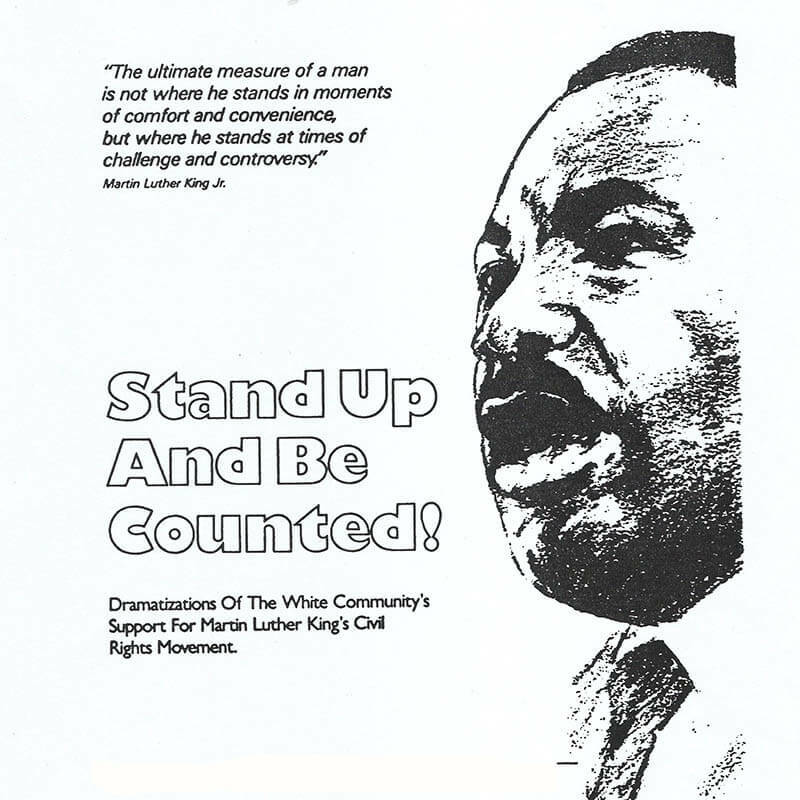 Stand Up & Be Counted! Not many people consider the white community’s support for the Civil Rights Movement. It is a surprise to comprehend that Martin Luther King spoke for all of us when he spoke of equality & non-violence. A series of dramatizations of those every day white heroes who stepped over the imaginary line dividing America by race for adults & school children, grades 4-12. Cast of two performers (m/f) or many performers. Time: Approximately 40 minutes. Students witnessed the sacrifices made by average white Americans. The play recreates instances of bravery on the part of ordinary people who dared to step across the line of segregation. The students became silent & fixed, finally punctuating the performance’s conclusion with vigorous applause. These are dramatizations of White America’s participation in the Civil Rights Movement, ‘the other side’ of the Civil Rights Movement. This is an unique program. I have never seen a program during Black History Month which emphasized the role of Whites. It’s good to get it from the white perspective. It’s a series of Civil Rights history lesson skits to enlighten predominantly white students. The goal was to interest the students in the Movement & in the idea that its message pertains not only to blacks, but to everyone. Sunrise & Dostis developed their play because they felt that too many young non-blacks viewed the Civil Rights Movement as a history lesson for others. The play is about those who stood up to be counted yet didn’t quite gain the recognition & popularity they deserve. This is a unique form of educational entertainment. Each scene change was smooth & convincing. 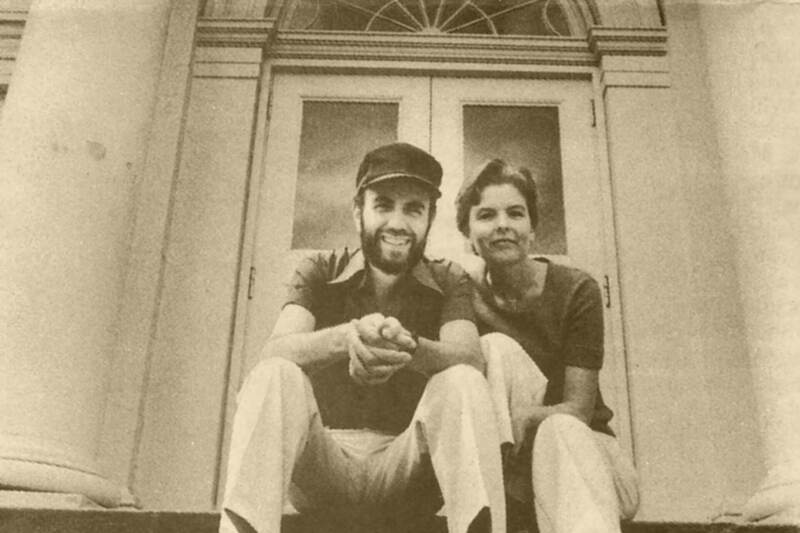 Thank you, Isaac & Diana for your marvelous efforts to rid the world of prejudice. Most of the individuals in the play are little known people, yet the context of their actions will be recognizable to those familiar with the Civil Rights struggle. The play is a series of 13 sketches. One sketch dramatized a dialogue between a principal & a racist teacher that looked at the desegregation of the Teaneck [NJ] School District. It should be relevant because there is still so much prejudice going around. My daughter, Merissa, said it was the best & most meaningful & thought-provoking assembly she’s attended. Thanks for enlightening her. The Civil Rights Movement was brought to life on Monday at Milburn High School in a tightly edited fabric of scenes. The message of the play was that all those who could no longer stay silent about the issue of segregation helped to bring about its demise. Our population of 84 emotionally disturbed adolescents was captivated by your theatrical style & informational presentation. Each & every skit was entertaining as well as informative. 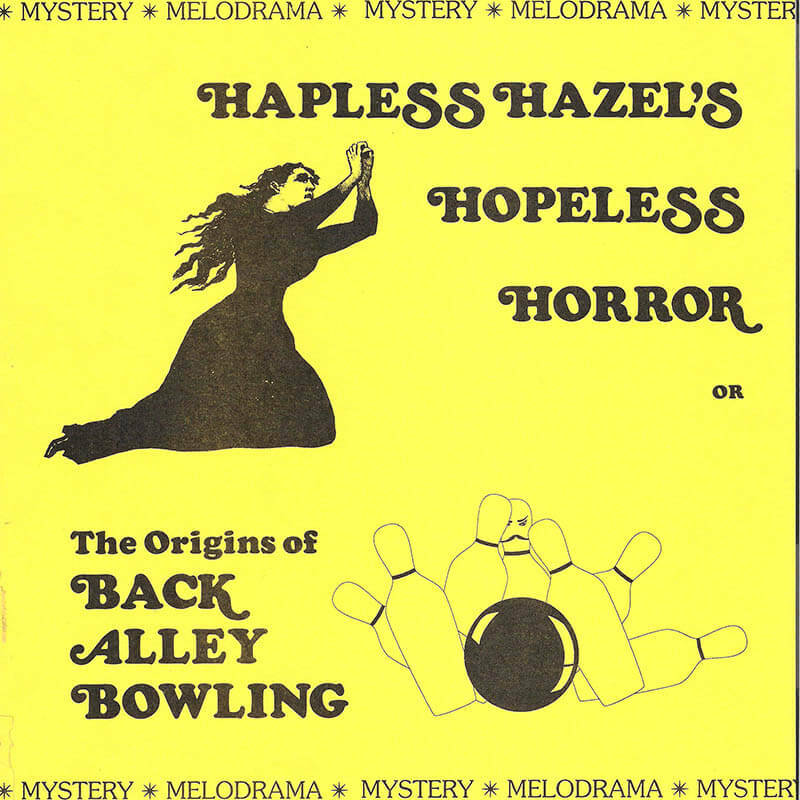 A mystery melodrama about the early days of bowling where the villain is hissed & the heroine is applauded, done in silent movie style. It offers us a look at the treatment of women in the 19th century through fun for all ages. Cast: Only two players needed (m/f). Time: Approximately 40 minutes. We enjoyed the participatory nature of the melodrama. It was wonderful to see an educational experience that can be such fun, too. 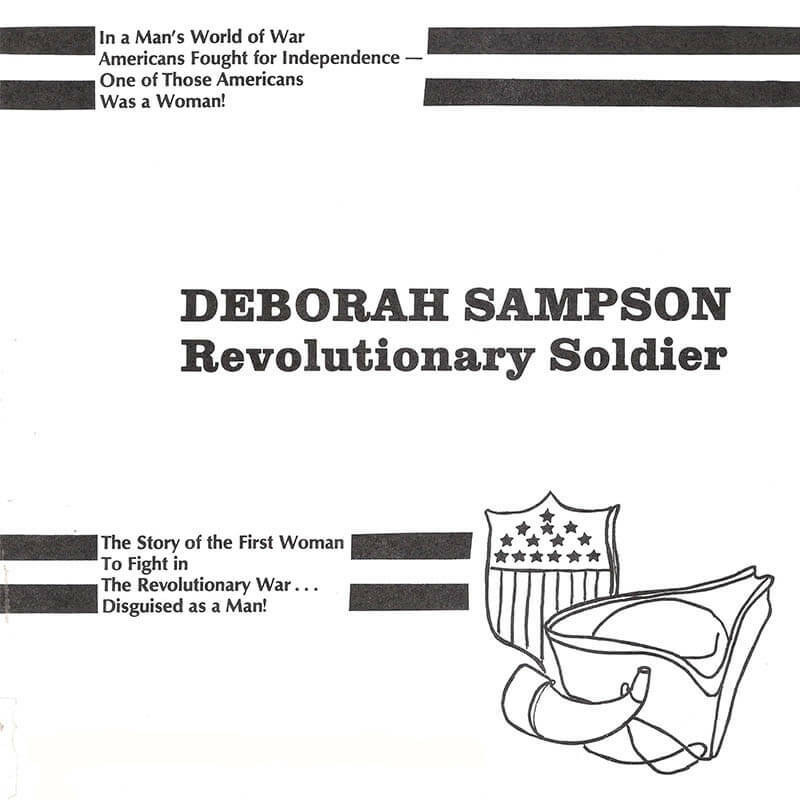 The first woman to fight in our War of Independence disguised as a man. Her trials & tribulations before, during & after her historical adventure are revisited. For adult, senior citizens & school children, grades 3-6. Cast of two performers (m/f) or many performers. Time: Approximately 35 minutes. The program content made the social studies curriculum come alive. It was all you said it would be, Isaac: Educational, engrossing & entertaining. Our students were enthralled with the story. You have helped us address important & current gender issues. The dramatization covered language arts as well. The performance was a very educational & informative ‘true’ story. As with any performance with Dostis & Sunrise, you always come & entertain & educate us, making us think.